If it is warmer inside than outside, condensation may form on the inner glass layer. If it is warmer outside than inside, condensation may form on the outer glass layer. Luckily, there are several simple and quick fixes you can try to help reduce and prevent condensation. To Keep or To Replace Your Patio Glass Door? So, should you keep or replace your patio glass door if it has interior condensation? If you’ve ever heard of the expression “If it ain’t broke, don’t fix it?” Similarly, unless there’s condensation between your double pane patio glass door or you are trying to maximize your energy savings by upgrading from single pane to double pane patio glass doors, you shouldn’t need to replace your doors. Upgrade Your Single Pane Windows→ See Your Options! You can shop for a dehumidifier, such as Damprid, on Amazon or at your local department store to help absorb moisture inside your home and reduce condensation on your patio glass door. Try to create a temperature inside your home that is comfortable but not drastically different from the outside temperature. 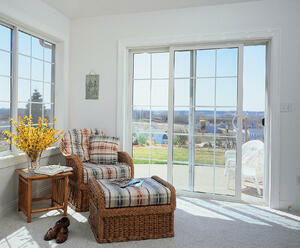 Keeping or Replacing Your Patio Glass Door? Patio glass door condensation can be a pesky recurrence. Just keep calm and remember that it’s a temporary situation and can be easily remedied by upgrading to double pane glass installations among several other simple solutions we’ve mentioned. Whether you plan to keep or replace your patio glass door, there’s always room for upgrading your installations and also, your patio screen enclosures. Click here to learn more about how our parent company Eastern Metal Supply can help you do just that or click the button below to learn more about how you can prevent and reduce window and door condensation.